"It often seems to me that the night is much more alive and richly colored than the day." The quote above was a quote written by Van Gogh to his brother Theo, explaining his enthrallment with the night. My fascination with the night sky and the stars is as rich as Vincent Van Gogh's love for the night. One night many years ago, I went to get something from the porch and I saw something in the sky. At first I thought it was a plane with its flickering lights, but it did not move through the sky. Maybe it was an alien ship with many colors? No, it couldn't be. As I stared at the sky for over an hour and imagined all the things that it could be, I finally accepted that it was a star. I did not know that a star could twinkle with every color of the rainbow. It was then that I realized the beauty of the night sky and the stars. On a different occasion about a year ago I drove down to Miami with Mat and our dog Sofi. I stared out of the passenger window at the tremendous sky and noticed a beautiful shiny star. Through out the drive I would look over to the star and it would still be there. I felt safe with that star. Since I am not a fan of long drives, especially with all the crazy drivers out there, I prayed to the star to keep us safe. The star heard my prayers and did just that. A car behind our car, lost control and then faced us for a couple of seconds, then drove of to my right side and tumbled. We felt very lucky that we were still in one piece and felt scared for the other driver. I called 911 and Mat pulled over. Another person pulled over as well and went to see if they were okay. We stayed in the car until the police arrived hoping they were fine. After that incident, I always look up to the star that saved us. I call it our star. 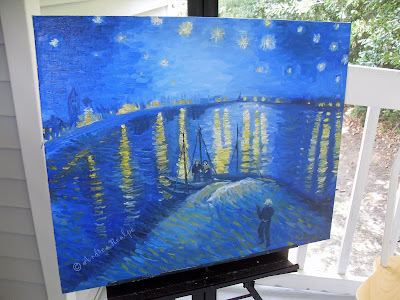 Those are some of the reasons I chose to reproduce Starry Night Over the Rhone with a twist. I call it Not All Love Stories Have a Happy Ending. My version doesn't compare to the original painting by Vincent Van Gogh, but it was fun creating it. This version has three people, two men and a woman. Create your story from the painting and post it in the comment section below. Purchase a print CLICK HERE.